1. 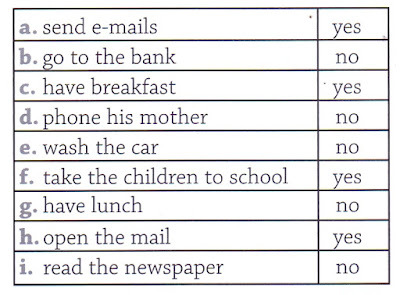 Rewrite the sentences in the negative form using yet. a) I've been to Paris. b) I've finished my homework. c) Mary's seen that movie. e) Patricia's met Susan's boyfriend. 2. Give affirmative answers to the questions using already and replacing the underlined words with the correct object pronouns. a) Have you called John? b) Have you mailed the letter? c) Have you bought bread for dinner? d) Have you washed the dishes? e) Have you cleaned your bedroom? 3. Complete the sentences with yet or already. a) I've ________________ fallen in love. b) They haven't kissed each other _______________. c) Have you ______________ invited your girlfriend to your party? d) They have _______________ broken up. e) She hasn't answered his love letters. _______________. 4. 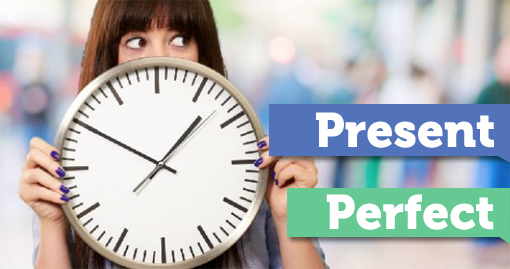 Write sentences in the present perfect using just. 5. Give personal short answers. a) Have you ever traveled by train? b) Have you already seen "Pirates of the Caribbean"? c) Have you ever lived in another city? d) Have you already had lunch today? e) Have you ever gone to a rock concert? B: No, she hasn't done her homework yet . B: I have dated Paul. B: I've met Kitty at school. B: Carol's waited for Paul about an hour and a half. B: No, she has never watched a western movie. 7. Read the chart and write what John "has done already" or "hasn't done yet". 8. 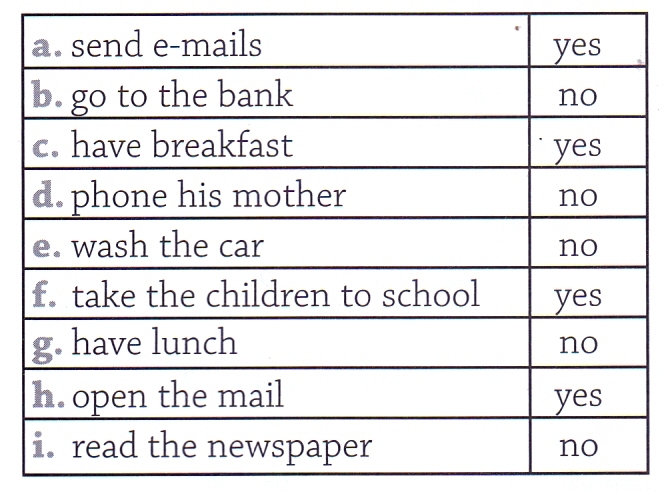 Complete the sentences in the present perfect with the verbs: do, meet, clean, move, study, watch, go, ride and buy. a) _________ you already _________ out with Mary? b) I _____________ Kitty yet. Is she at school? c) ___________ she already ____________ to her new flat? d) ___________ you already ___________ your homework? e) They __________ never ___________ a horse. f) We _______________ my cousin's birthday present yet. g) ___________ you already ____________ your bedroom? h) Tobby ____________ never ____________ horror movies. i) ____________ Carol already ___________ for the science test? a) I haven't been to Paris yet. b) I haven't finished my homework yet. c) Mary hasn't seen that movie yet. d) Jim hasn't eaten breakfast yet. e) Patricia hasn't met Susan's boyfriend yet. a) Yes, I've already called him. b) Yes, I've already mailed it. c) Yes, I've already bought it. d) Yes, I've already washed them. e) Yes, I've already cleaned it. a) Eric has just arrived here. b) Mary has just seen her teacher. c) We have just met our friend. d) Kate has just called me. e) Jim and Leo have just finished their homework. A: Has she already done her homework? A: Who have you dated? A: Where have you met Kitty? A: How long has Carol waited for Paul? A: Has she ever watched a western movie? a) He has already sent e-mails. b) He hasn't gone to the bank yet. c) He has already had breakfast. d) He hasn't phoned his mother yet. e) He hasn't washed the car yet. f) He has already taken the children to school. g) He hasn't had lunch yet. h) He has already opened the mail. i) He hasn't read the newspaper yet. a) Have you already gone out with Mary? b) I haven't met Kitty yet. Is she at school? c) Has she already moved to her new flat? d) Have you already done your homework? e) They have never ridden a horse. f) We haven't bought my cousin's birthday present yet. g) Have you already cleaned your bedroom? h) Tobby has never watched horror movies. i) Has Carol already studied for the science test?